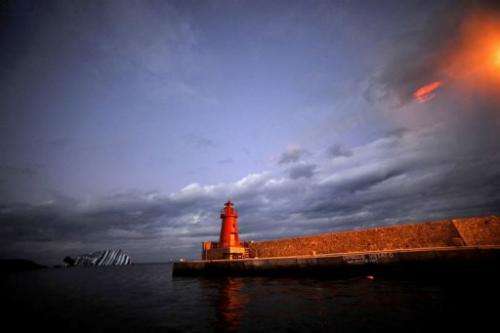 Boats patrol near the Costa Concordia on January 15 after the cruise ship ran aground and keeled over off the Isola del Giglio. Fears of an environmental disaster from the ship in an area of outstanding natural beauty in Italy have risen as hopes faded of finding any more survivors on board. Fears rose of an environmental disaster from a wrecked cruise ship in an area of outstanding natural beauty in Italy on Monday as hopes faded of finding any more survivors on board. "This is an ecological timebomb," Sergio Ortelli, mayor of the picturesque Tuscan island where the luxury Costa Concordia liner hit underwater rocks and keeled over on Friday with more than 4,200 passengers and crew aboard. Ortelli said there were 2,380 tons of fuel on the ship, which had just started its cruise when it ran aground. "This is the second worry, after human lives," he said, as crews began putting down anti-spill booms. "I hope that the fuel can be taken off the ship soon and maybe the ship can be removed too because it is hampering navigation," he said. "We are monitoring constantly but there has been no spill so far," he added. At least 15 people were still feared trapped in the wreckage after the disaster which left at least six dead, including two French passengers and one Peruvian crewman who drowned jumping off the ship in a chaotic evacuation. Famous for its sandy beaches and rustic charm, Giglio is a major holiday destination in the summer when the population swells from around 800 permanent residents to some 5,000 people and is dotted with exclusive villas. The island is also a major marine sanctuary and popular for whale-spotting. 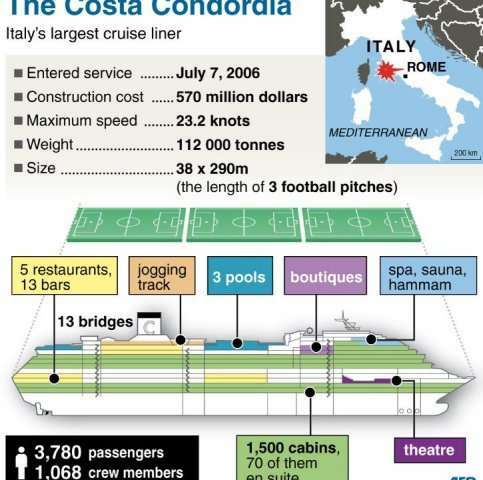 Factfile on the Italian cruise liner Costa Concordia. Fears of an environmental disaster from the wrecked cruise ship in an area of outstanding natural beauty in Italy are growing as hopes faded of finding any more survivors on board. Local officials are calling for new rules imposing strict limits on navigation in the area and in particular an end to the practice of "showboating" when cruise ships file past close to the island. 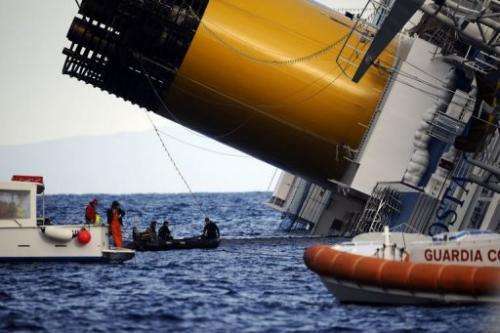 The owners of the ship, Costa Crociere, have been instructed by coastguards "to remove the wreck of the ship and avoid any spill of oil into the sea," said Filippo Marini, head of the local coastguard press office. "We are putting in place booms right now but so far there hasn't been any leak. There is maximum attention on the environmental problem. We are all working together to resolve this as soon as possible," he said. Dutch firm Smit, one of the largest marine salvage companies in the world, told AFP it had been hired to pump out the fuel from the 114,500-ton wreck. "The owner of the vessel has asked us to ensure that the oil is brought out of the vessel safely," said Martijn Schuttevaer, spokesman for Boskalis, Smit's holding company. He said the operation was expected to start within days and that 20 workers from Smit would travel to Giglio on Monday to coordinate the operation. The Costa Concordia cruiseship is seen on January 15 in the harbor of the Tuscan island of Giglio after it ran aground and keeled over after hitting underwater rocks. Fears of an environmental disaster from the wrecked cruise ship in an area of outstanding natural beauty in Italy are growing. as hopes faded of finding any more survivors on board. A representative from US-based Titan Salvage, who was also on Giglio, said the contract could run into the millions of euros (dollars). "They've been phenomenally lucky there's been no spill. If the hole in the hull had been four or five metres further along it would have punctured the tanks," he said. "It's very close to the edge of much deeper water," said the man, explaining that the waves could push it off its resting place and it could sink entirely. The fuel pumped out of the ship will be replaced by water in the tanks to ensure that the ship remained stable in a practice known as "hot tapping." 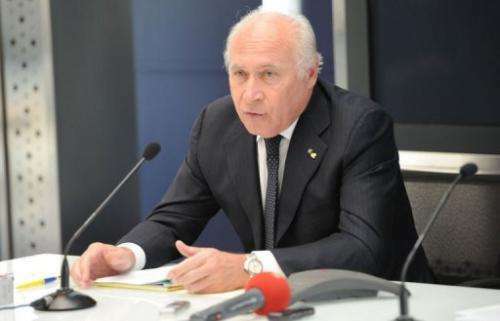 Environment Minister Corrado Clini meanwhile said that the environmental risk has been "our nightmare." Pier Luigi Foschi, chief executive of Costa Crociere, answers journalist's questions at the Costa headquarters in Genova on January 16. Fears are growing of an environmental disaster from the wrecked ship in an area of outstanding natural beauty in Italy as hopes faded of finding any more survivors on board. "The vessel has reservoirs full of fuel, it is a heavy diesel which could sink down to the seabed, that would be a disaster," he said. In a worst-case scenario, the fuel could "leak into the sea, contaminating an exceptional coastline and affecting marine and bird life," he warned. "We are ready to intervene if there is a spill," Clini said. "As soon as possible, the fuel will be removed from the vessel. But we have to take into account the precarious state of the ship." Costa Crociere head Pier Luigi Foschi said Monday the company had commissioned several firms to look at the best way to salvage the vessel. He said the first priorities were pumping out the fuel and plugging the gash in the hull. Foschi said he understood fears of an environmental disaster from leaking fuel oil, but stressed that there had been no signs of this. The article was ok, but what is up with the graphic? They say it is the length of 3 "football pitches" then show three basketball court diagrams to make their point. Dan, Try reading the article next time. They look like soccer pitches to me. Also known around the world as football. Tons is not a measurement of volume. The dry weight of the ship is 112,000 tons. Add 2,380 tons of fuel and you get 114,380 tons. 51,387 tonnes is the amount of water that the ship displaces when in water. Hence the word displacement. And a ton is not the same as a tonne. Now, keep doing your homework at pre-school and one day you may have an IQ. The only confusing thing is you. You got me on the soccer field, I'm American, and generally ignore soccer. My bad. Gross Tonnage for ships is a measure of the enclosed space on the ship. Look it up! "beyondships2.com/faq-gross-tonnage.html"
The Costa Cruises specification page lists the Costa Concordia as 114,500 Gross Tons. The only listing I have found for the displacement tonnage for the Costa Concordia was on Wikipiedia, which stated 51,387. That sounds about right for a cruise ship of that size, although it's precision sounds a little suspect, and I don't normally use Wiki as a primary source. A ship floating on water displaces a mass of water equal to it's own mass. That's why it floats. Your assertion that it could weigh 114,000 tons and only displace 51,387 tons of water suggests that it has some sort of anti-gravity system to support the other 63,000 tons! And yes, I know that the term 'tonne' means metric ton.